Freedom of Information, your Texas? If Governor-elect Abbott continues like State Attorney General Abbott, Texas will be seen increasingly like a 3rd world banana Republic, than a first world economy and US super state. In the modern connected world, successful governments and organizations thrive on openness and transparency. The people don’t need to be told everything all the time, they do though have both the right and have the confidence to know their government and politicians are acting lawfully. Congratulations to Governor Elect Greg Abbott. Here is hoping that Governor Elect Abbott will understand the big difference between being Attorney General and being Governor. As attorney general he used his legal knowledge, and qualifications to hide, obfuscate and in some cases flat out refused to allow disclosure of reasonable information to the public about the operation of their government, and the state. The picture above is taken from last weeks Austin American Statesman front page. It doesn’t matter if I, or you, agree with his politics, what should be beyond question is his (mis)use of the law to hide what he’d done. 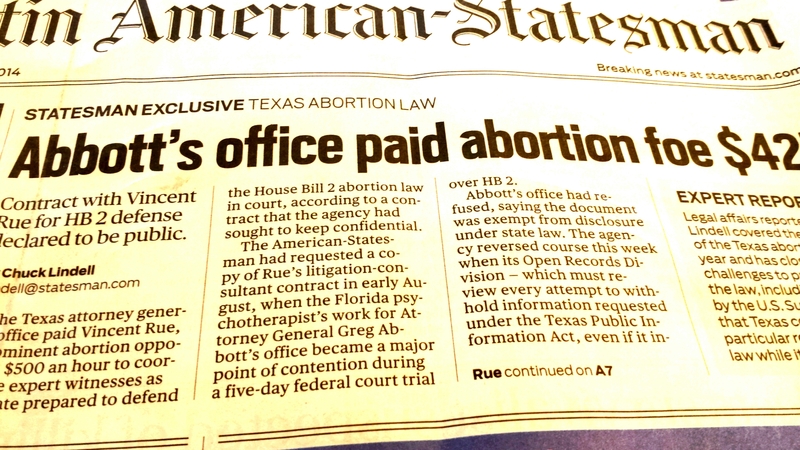 In this instance, the Statesman had applied for a copy of an abortion lobbyist/litigation-consultant contract to work with the Attorney Generals’ own office during the HB2 bill process in 2013. The contract became a big deal during the five-day federal court trial over HB2. Abbott’s office refused to release the document saying it was exempt. In a strange reversal, after early voting closed, the Open Records Division allowed its’ release. Abbott tried to claim the consultant was a distraction, and there we have the problem. When government agencies are ashamed of its’ actions they look to bury the news, or hide the truth. The government becomes the problem, not the truth. Fighting disclosure of information about the Texas Enterprise fund which he was charged with overseeing. Interestingly, only today has the UK Government sent a take-over squad into a London Borough for doing essentially the same thing with much smaller amount of money. [Evening Standard]. Reversed a prior decision, allowing the State to keep secret Information about Pharmacy’s providing lethal injections for State Executions. As is often the case, this was done for security reason, without providing any supporting evidence the threat being credible. 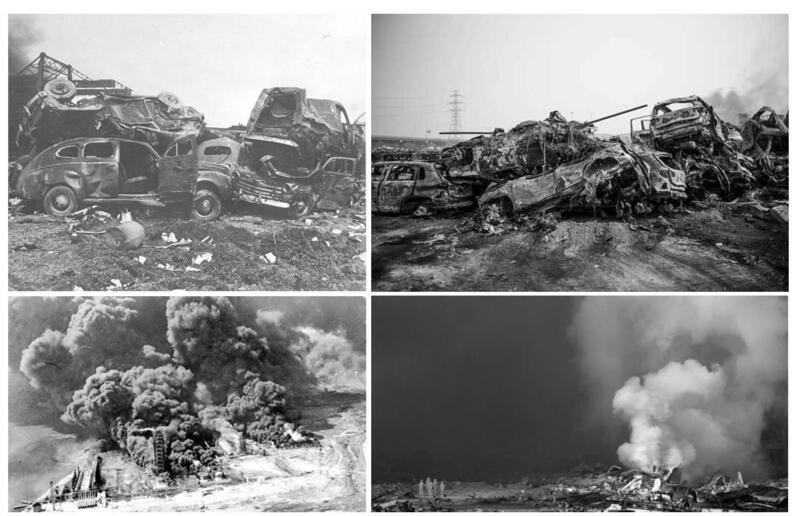 Then there is the curious case of the State Register of Dangerous Chemical storage. The State keeps the information and requires its’ disclosure. However, the individual Texan is not allowed access to the data, we must go around to their door, knock, wait and ask what they are storing and trust they’d tell us the truth. Assuming we know he they are in the first place, which of curse we don’t. Again, this was justified under using that hoary old chestnut, security. Which belies the fact that any decent terrorist group would likely have the information, and if not, have the technology to find out, where as the average Texan doesn’t. Abbott ruled to keep Governor Perrys’ travel records and expenses a secret, again for security reasons. Again the issue came up as one of oversight and expense, this time for the security detail on trips which some feel were not State business. While there is some justification to re-dact specific detail which could reveal the number and identity of people, places or organizations that protect the Governor, there is really no reason to not publish things that are already public record and the security cost associated with them. Governor-elect Abbott do you want to spend your time being a distraction, or are you actually going to lead? (1)Except those in the Texas Republican bubble who don’t see out-of-state mail-in voting as at all open to fraud, and who seemed to have overlooked some 100,000 plus legal immigrants who could vote under these regulations. Author Mark CathcartPosted on November 6, 2014 November 5, 2014 Categories LifeTags abbott, governor, politics, texas, votingLeave a comment on Freedom of Information, your Texas? It’s been an interesting month. I live in Austin Texas, boom town USA. Everything is happening in construction, although nothing much in transport. In many ways Austin reminds me of rapidly developing cities in China, India and other developing countries. I’ve travelled some inside Texas, but most on I10 and out East. I’ve tended to dismiss what I’ve seen in small towns, mostly because I figured they were unrepresentative. Earlier this month I did my first real US roadtrip. I had my Mum with me for a month and figured a week or so out of the heat of Texas would be a good thing. We covered 2,500 miles, most up from North West Texas, also New Mexico, and Colorado. On the way back we went via Taos, Santa Fe, and Roswell and then back through West Texas. There they were small town after small town, decaying. Every now and again you’d drive through a bigger town that wasn’t as bad, but overall massive decay, mostly in the commercial space. Companies had given up, gone bust, or got run out of town by a Walmart 30-50 miles away. Even in the bigger ones, there was really no choice, there were Dollar Stores, Pizza Hut, McDonalds or Burger King, Sonic or Dairy Queen, and gas stations. Really not much else, except maybe a Mexican food stop. It was only just before sunset on the drive back through West Texas, with my Mum asleep in the backseat, I worked out that my camera and telephoto lens rested perfectly between the steering wheel and the dashboard and I started taking pictures. These are totally representative with what I’ve seen all over Texas. Just like the small towns out near Crockett and Lufkin in East Texas; pretty similar to anything over near Midland; outside El Paso; down south towards Galveston. Decaying Texas. What there were plenty of, in the miles and miles of flat straight roads, were oil derricks, and tankers, hundreds upon hundreds of them. It’s not clear to me what Governor Perry means when he talks about the Texas Miracle, but these small towns, and to some degree, smaller cities have more in common with the towns and cities in China and India, slowly being deserted, run down in the rush to the big cities. The pictures above tell the story of a dying West Texas town and the changing landscape of population movement away from the agrarian society to the city. 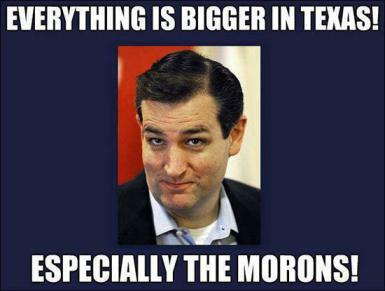 And says FU to Texas water users. Attorney general Abbott knows the law, if nothing else. Texas is a property rights state, along with which come a number of other rights, not normally recognized as either good for the Commons, or not allowed by law in a modern democracy. Those rights include everything under the property, which would obviously include oil gas shale, but in this instance include water. 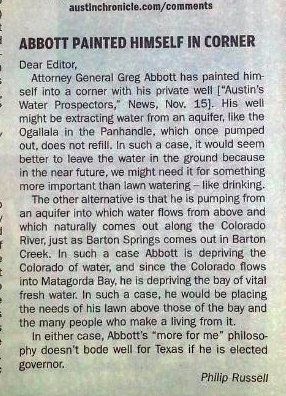 Abbott must like a green lawn, we all do, but for the most part it has become impractical and should be unaffordable to waste water on a lawn. In what are record drought conditions with numerous businesses affected, boat docks, related people and business, plus the farmers and rice fields downstream from Austin getting more and more severe restrictions, you’d think the candidate for Governor of Texas would lead by example, apparently he is, he’s drilled a well on his property and is watering his lawn from it. 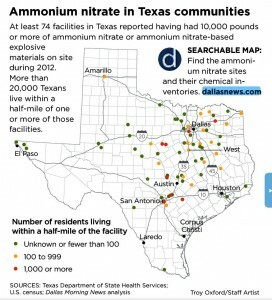 This article in the Texas Tribune covers the details. This letter in the current Austin Chronicle, by Philip Russell explains why Abbott is wrong, either way. Doesn’t Texas deserve better than this? In the interests of transparency, I have a sprinkler system, it was installed when the house was built and generally never gets used. I can’t say I’ve never used it, I have, but not this year. My neighbor replaced half the turf on my lawn to stop the weeds spreading to his lawn, I’ve not watered it since. Also, since our drains run directly into the creek and town lake, I won’t use weed killer or chemicals on the lawn. I’ve seen it many times over the years in business. A new guy shows up, he was unexpected. He seems fine at first and then he starts cleaning house, reorganising, people get fired, departments get cut and before you know it, he is gone. Paid off handsomely, publicly, because they wanted his silence, privately because he’d done his job, he was Leon, The Professional. What happens next is the old guard regroup, they step out of the shadows and everything goes just the way they wanted it. The hired guy was the fall guy, the one to take the heat. Here in Texas we are a year out from the election for a new governor, and the race has most definitely started. 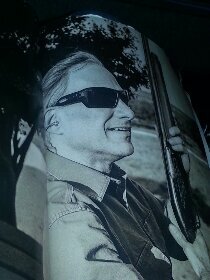 Texas Monthly magazine October 2013 has a profile of who it calls unequivocally, “THE GOV*” with the * denoting “barring an unlikely occurrence” and it includes this picture. Abbott is my age, he represents and is focussed on appealing to the traditional Texas ol’ boys, guns, small government, low taxes, low regulation etc. Texas monthly carries an article on the likely competitors to Abbott, but given Abbott resplendent with Shotgun and Wheelchair is featured on the front page, and their prediction, that Abbott will be “The Gov” barring an unlikely occurrence, you can’t take them too seriously. Not so much what’s in, More what’s not. More interesting, although explainable given the timing of the magazine print edition, and the announcement by Debra Medina, that she is considering a run for governor, as an Independent. Medina lost in the 2010 Republican Party Primary Election, taken by Governor Perry. Medina, had been raising money for a state comptroller bid, said, according to this Texas Tribune report, “has received millions of dollars in pledges on the condition that she instead run for governor as an independent.”. Would that make Medina, Leonora? The Trib’ focuses on Medina ability to change the outcome of the election without either hinting or mentioning the Democratic front-runner, Wendy Davis. The Trib’ says “One way to win an election is to change the electorate. That’s not as nefarious as it might sound”.. “Another way is to split the votes among more than two candidates. In primaries, that often forces runoffs. In general elections, third-party candidates can sometimes grab enough votes to change the outcome.” And they go on to review Bush vs Clinton, and Perot. Who ever is offering Medina millions to run as an Independent for Governor, isn’t doing it to split the vote of the Republicans, she will be a shill, put in to collect the votes of the more liberal, center leaning Republicans, especially the growing, base of GOP Women voters. Those voters, even the more christian right, must be horrified by recent moves including State bill HB2 that will have a drastic effect on both womens services as well as the ability, choice and availability of a great number of womens services. Given an appropriate campaign by Democrat Wendy Davis, there was always the chance Davis would not only been able to muster the democratic and independent candidates, but also those of many Republican women. With Medina in as a shill, she can appeal and win that vote, denying Davis. Heck, Medina can come in and participate in an all out catfight with Davis, while Abbott et al. wait in the shadows, only to appear on election night after the “public” dismal of Medina aka The Professional.